When I first started researching for companies to feature on Got Soul, I stumbled across a company that ticked every box of what I wanted Got Soul to be about. They were Australian. Made cool, high quality gear that uses as ethical as possible materials & production, with an inspiring social mission behind their business model. This company was Smile. A casual clothing company founded by Sunshine Coast local surfers, Soren Molineux and Bede Carmine. I was so delighted to see a reply to my email from Soren saying he'd be stoked for Smile. to be featured on Got Soul. It's taken me this long to get the story up because between managing a business that is experiencing huge growth, delivering 5,000 school uniforms & t-shirts to children in need throughout South East Asia and surfing some of the most remote places on earth, it hasn't been the easiest of tasks catching up with them for a chat. However, I finally managed to find some time and am now so excited to share with you my conversation with Soren and the story behind Smile. Firstly, I have to say that what you guys are doing I think is truly inspiring! What inspired you to start Smile? Thanks very much. Smile started about 4 years ago - at least in its inception. The idea was fairly simple really, myself and a few buddies were looking for a way to give back to the communities in which we have extensively travelled and surfed in over the years. Initially, we were not sure how this would best fit, or at least how we could create a sustainable method of giving. After much thought, I figured the best way to support communities on an ongoing basis, was to create a One for One clothing business, with areas of focussed assistance targeting school uniforms to children in need. This was important to us, as we had often found ourselves in areas where school uniforms were not readily available, or in same cases not available at all. This meant that kids we had met could often not go to school consistently. A few of my buddies loved the idea, and very early on this was how Smile was born. We have only been trading for just over 2 years, with the initial time consisting of trial clothing drops in Indonesia, and of course learning our product from start to finish. During the past few years, our clothing drops have resulted in us being able to give over 5,500 school uniforms or T-shirts to children in need. The regions we have been lucky enough to work with have been Indonesia, Cambodia, Sri Lanka, India, Kenya & Australia (Remote Northern Territory). Can you share with us how the give first, wear second/one for one works? For every garment we sell, we will donate a school uniform or T-shirt to a child in need. One for One. Where possible, we try as hard as we can to work with the local communities and organisations to which we are travelling to in order to figure out the best fit (pardon the pun) for what is most required. I'm sure there's been a lot of highlights since you started Smile, however is there one that really stands out? By far the best part of what we do is the clothing drop trips. Being able to give to children less fortunate than ourselves is a surreal feeling. As cliche as it probably sounds, not only is it great to see all the kids smiling and having a fantastic time, but I guess each clothing drop reinstates what we are all working for, and gives each of us a sharp realisation that the small difference we are trying to make is slowly but surely working. Another notable mention is seeing our customer base and online communities grow, especially all the extremely humbling messages of support we receive from all kinds of people. On the other hand like any business there are hard lessons learnt especially when starting out. What are some of the lessons you've learnt? Besides the obvious 'business start up' type issues that everyone faces, the one that stands out is production. Especially when we have not been able to spend as much time as we would have liked overseeing the process. This is far less an issue these days, and to be honest nothing has been beyond fixing. Not too many complaints our end I guess. New 'Chutes' Boardshorts. Available online soon in two colourways. Seen here in full trim. Indonesia, 2013. Can you tell us about the range and style of apparel Smile offers? Smile offers fairly simple clothes for both men & women, that would best be described as casual clothing that has its roots in ocean faring and outdoor activities. We are not trying to be on the vanguard of fashion, I guess it is all relatively simple gear in nice cuts and basic colourways that due to our growing up on the East Coast of Australia probably is best suited to a coastline. That being said, we have noticed that people from all walks of life enjoy our garments, whether in Noosa, Zurich (in the summertime) or Bali. Where can we get our hands on some it and what $$ are looking at for it? 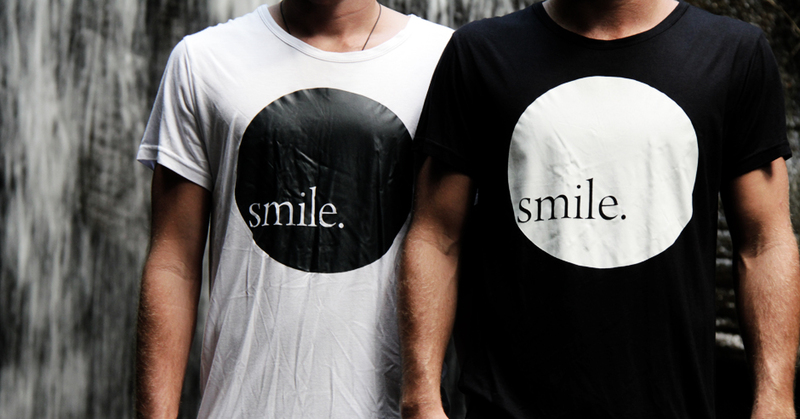 Our online store is available at www.smileclothing.co/shop. Our new range is just about to come online and we are super happy with the results and larger options we will now be able to offer our customers. Garments range between $45 - $70 across the board. What do you guys do when you're not working on Smile? Up until recently, all 5 active members of the Smile team had other full time vocations. We have, up until this point, been balancing full time work in a whole manner of industries, and gettingSmile done in our spare/hobby time. With the scales tipping to Smiles favour, 2 of us have now taken residence in Indonesia to concentrate on Smile full time, with the other members still actively contributing in their spare time. In down time, we would best be described as a relatively active bunch, with most of us spending as much time in the outdoors, predominately the ocean and travelling the open road. With more time to concentrate on Smile, we hope to continue giving to children in need, just on a greater scale and a more World Wide scope. We truly hope that the next 12 months enables us to continue working on Smile full time, and to continue doing what we love by assisting others in remote locations. The more people we can make aware of Smile, the more clothes we can sell. This ultimately means more uniforms and T-shirts to children in need. This is, and will always be, the goal for Smile. Have also got some exciting collaborations lined up in the near future, which we will continue working on. Would like to say some nice, uncrowded waves as well, but we shall see.